Crochet over a plain bangle bracelet with metallic yarn and this free pattern from Phyllis Serbes of Many Creative Gifts. 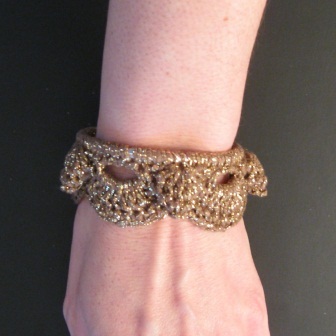 This bracelet crochet pattern makes for a quick project. Crochet this intermediate-level bracelet for a Mother's Day gift! Size: Choose a thin bangle bracelet that fits comfortably; finished crocheted bangle measures 1 inch in width. NOTE- You may need to modify the pattern for larger-sized bangles. This is a marvelous idea. I like the fact that it doesn't take much yarn and is very easy to make. You can dress it up a bit if you like. I will be adding small or seed beds to mine to give it just a little bling. My grand daughters will be in red and green with tiny jingle bells. A pattern like this is is good for many times of projects. I can see using this as a trim for a bath towel. Take a nice quality cotton towel and add this beautiful trim! Or, if you have a good quality white tee shirt, make this trim in black to add to the sleeves and the bottom of the shirt to make a basic tee much more unique and special. That sounds like a marvelous idea. I can also see this being trim for the nice decorative towels my mom keeps hanging over our sink. It just adds a touch of elegance to an otherwise drab towel! With 70 sc as a start, I was able to make 6 complete repeats around the bangles I used.Awesome design! I've used 3 different yarns so far. Try as I might i just could not work through this pattern. It read a little odd to me. I was able to create for myself a very cool bracelet....thanks for the inspiration. Yes, it could be knitted. Just find an edging pattern that you like and along thee edge that would be sewn onto an item, just add at least 3 or 4 more sts. Decide how long it needs to be made to fit your wrist and add a little bit for your hand to slip through. Lay it out flat and lay a thin elastic on the edge and fold it over. Sew it down and sew the ends together as well as the elastic. I have made these before using knit cro sheen thread and they turned out great. 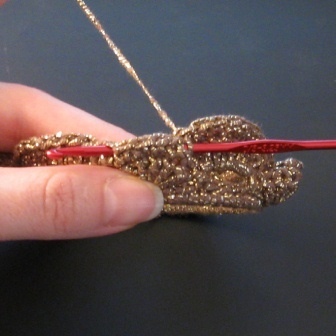 You can also make a necklace this same way. It looks very vintage and rests on the neck nicely. I sew either velvet or satin ribbon to the ends to tie the necklace on and have even put the ribbon on the bracelets instead of sewing the ends together. Hope this helps. Is there any way that this could be knitted?